Captain Thorne Sherman (James Best who played Sheriff Rosco Coltrane in the T.V. series THE DUKES OF HAZZARD), alongside his shipmate 'Rook' Griswold are sailing to an isolated island to bring some precious cargo to a small team of scientists. Once they arrive a storm picks up and they are unable to leave the island, so are offered to stay at the cabin by Ann who is the daughter of lead scientist Dr. Marlowe Craigis. Thorne soon discovers that it is not only the storm they will have to contend with this night, as the scientists have created giant mutant killer shrews which will stop at nothing to get their next meal. When one of the occupants of the cabin is bit by one of the shrews, they find that the shrews saliva contains a poison which can kill in a matter of seconds. With the knowledge that they are not safe they must survive the night and wait for the sun to rise to make a break back to Thorne's boat and sail off to safety. 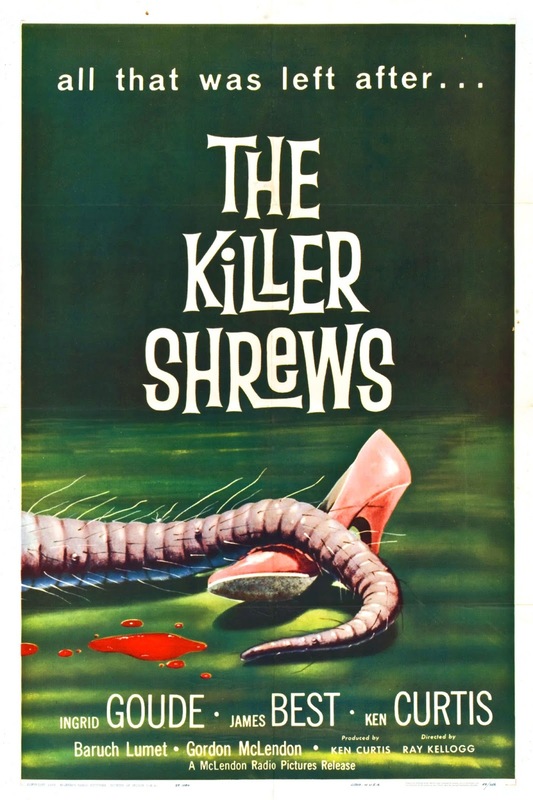 THE KILLER SHREWS is a cult classic and stands out probably more due to its poster and trailer then the actual movie. 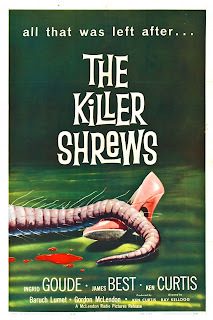 By todays standards of CGI monsters the killer shrews may seem ridiculous. Even more so when you get to see the killer shrews themselves which are nothing more then dogs draped in what looks to be disheveled rugs. As is the case with these movies anybody who is white will most likely survive the movie, and if your a foreigner well your cards are up before you even say a word. The pace of the movie is quite fast and doesn't have any moments to allow the audience to relax, you can just imagine how this would have played out in the cinemas back in the day. The budget of the movie is estimated to be $123,000, whether this is for everything or just the obscene amount of alcohol everyone drinks in the film is another story. THE KILLER SHREWS is an entertaining movie and is one that you will come back to time and time again. Ray Kellogg didn't direct many movies but this and THE GIANT GILA MONSTER (1959) have garnered a cult following.